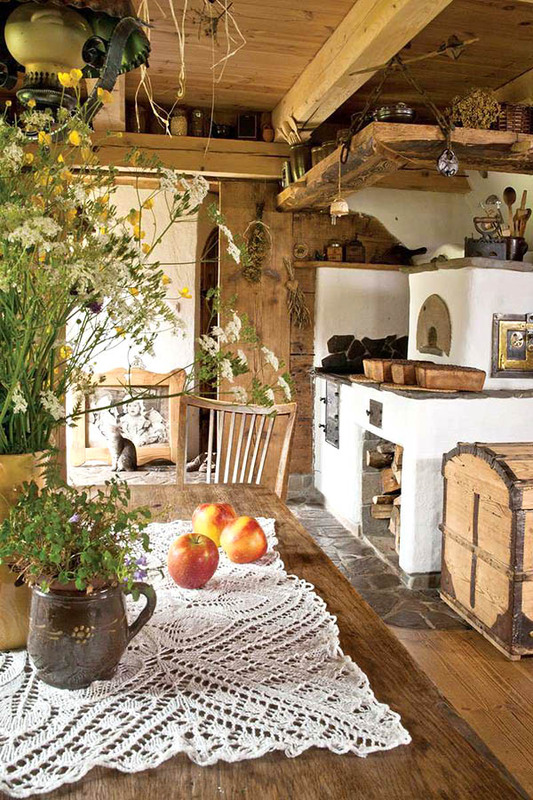 Can we sit for a minute to enjoy the absolute prettiness of the farmhouse decoration? The best thing that has always been appealing to me about it is the rustic feeling of it all. The simplicity, the wooden furniture that it’s looks like it is 100’s of years old. 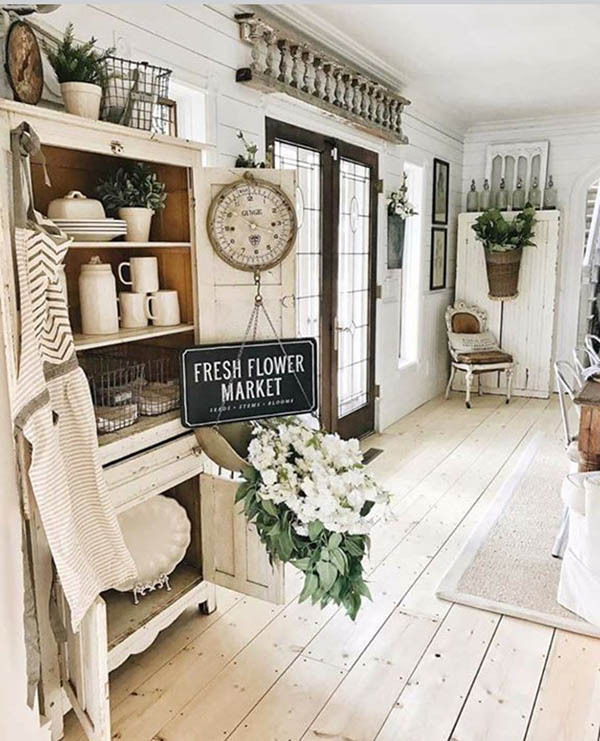 To understand what I am talking about, here are 25 lovely farmhouse kitchen décor ideas I’ve found that you would fall in love with. 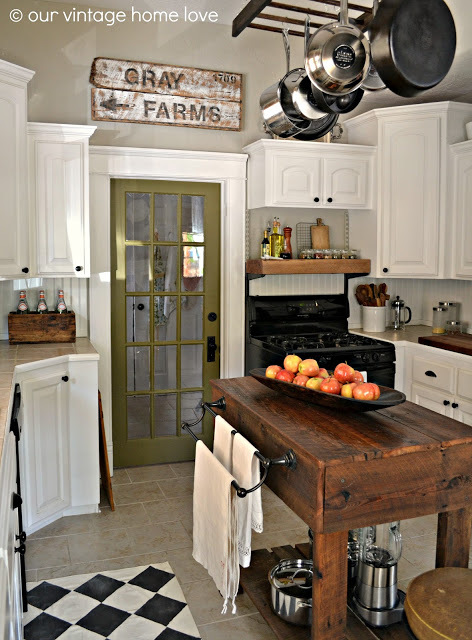 To start, I’ve chosen one of my favorite farmhouse kitchen ideas. What I truly like about this design are the white elements well-combined with the walls painted in Intellectual grey by Sherwin Williams. The small colorful accents such as the greenery and the pumpkins make this kitchen decor even cuter! Compared to the first one, this farmhouse kitchen decor looks more contemporary. The best thing about it is the symmetry which brings a sense of harmony and coziness. 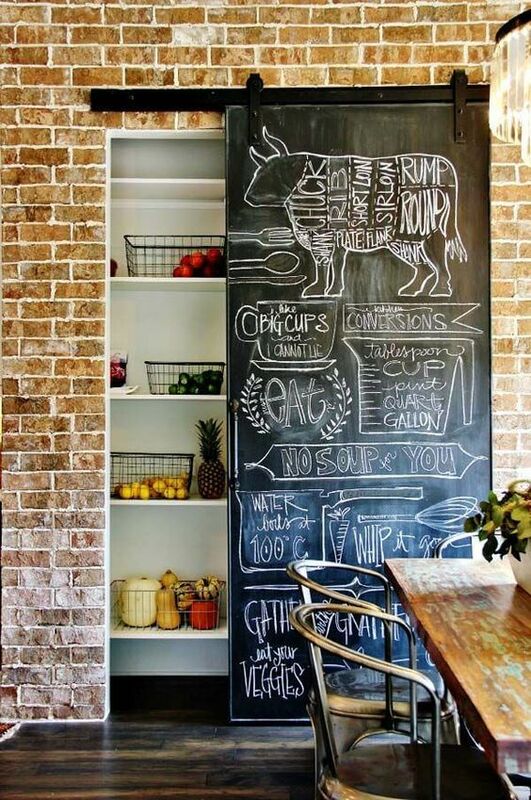 Like in our article about Farmhouse storage ideas, this one is very space saving. The first thing that came to my mind when I saw this picture was ”a French pâtisserie” (bakery)…then I saw the cute sign “Coffee is always a good idea” and my initial association was confirmed. The milky pastel tones of the dishes pair well with the white vintage cupboard and the tiny wooden shelves. This amazing DIY 3-tier wood stand could stay over some of your farmhouse kitchen cabinets. I’ve always loved how the ceramics fit well the wood. 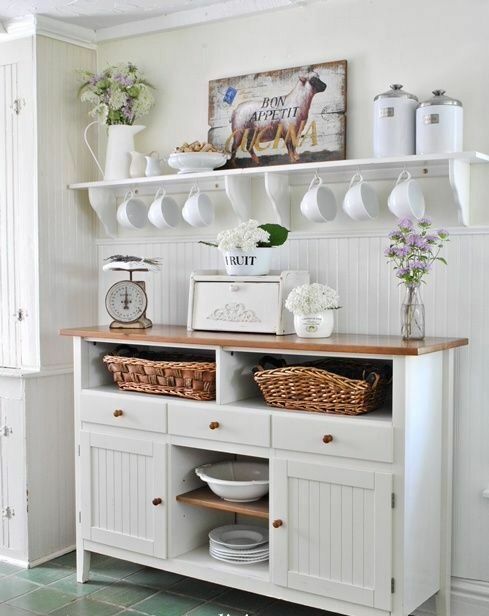 This is another white farmhouse kitchen decor which successfully combines wood and metal. The metal chairs and the small wall signs give edgy touches to the meaning of the word classic. 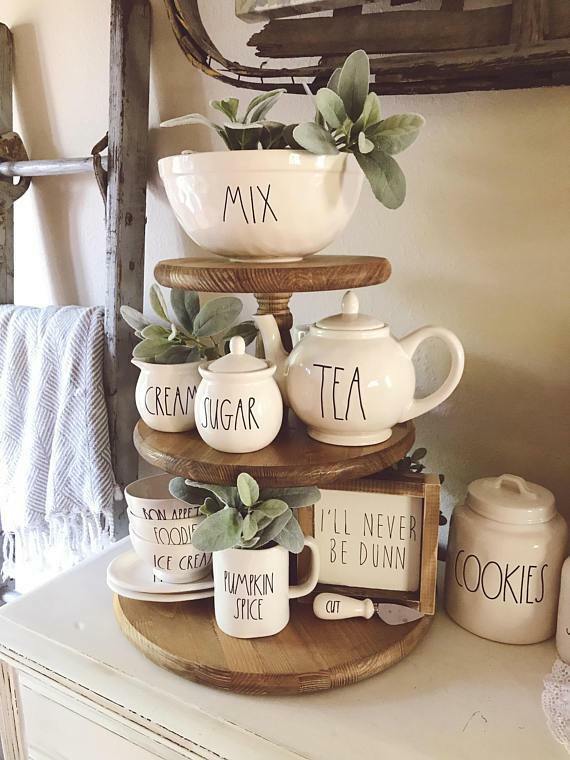 If you are wondering how to decorate a farmhouse kitchen, here is a thought – make some layers, add some texture with lots of accessories, flower pots etc. Minimalism is not very typical for this kind of decoration. 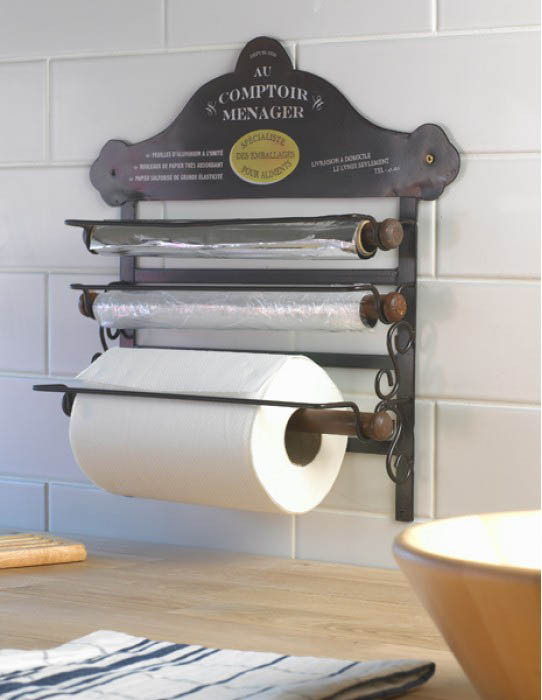 This splendid old French styled wall mounted, kitchen roll and foil holder is an absolute winner in a farmhouse kitchen. This bold farmhouse wall decor is made of a wrapping paper roll. 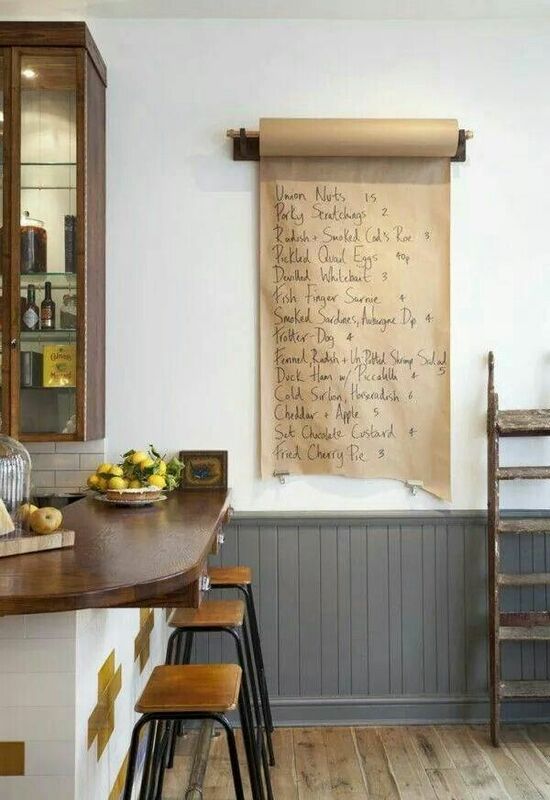 Just a hint – instead of making it as a page of a waiter’s old server book, you can hand-write the recipe for your favorite cherry pie or cheesecake, for instance. 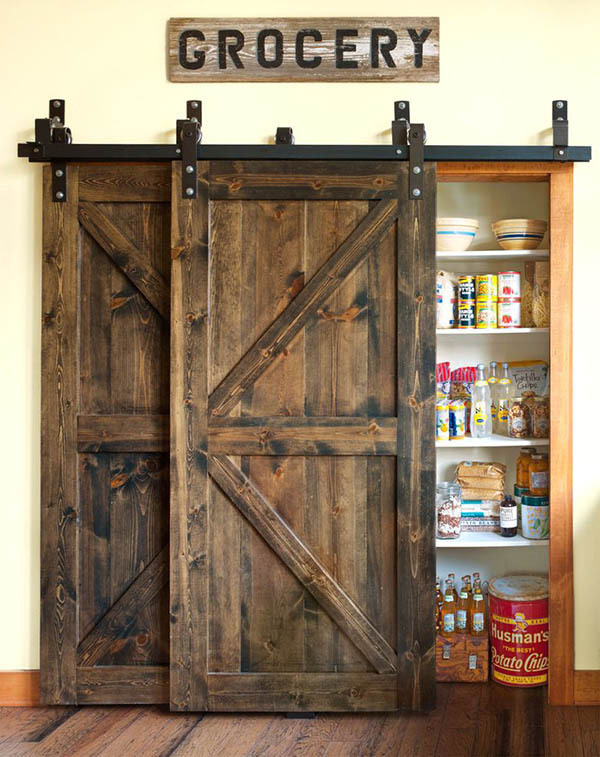 This sliding door is also a farmhouse wall art. It is painted with a black chalk paint which, by the way, makes a good contrast with the brick wall. I just love this rustic vibe! 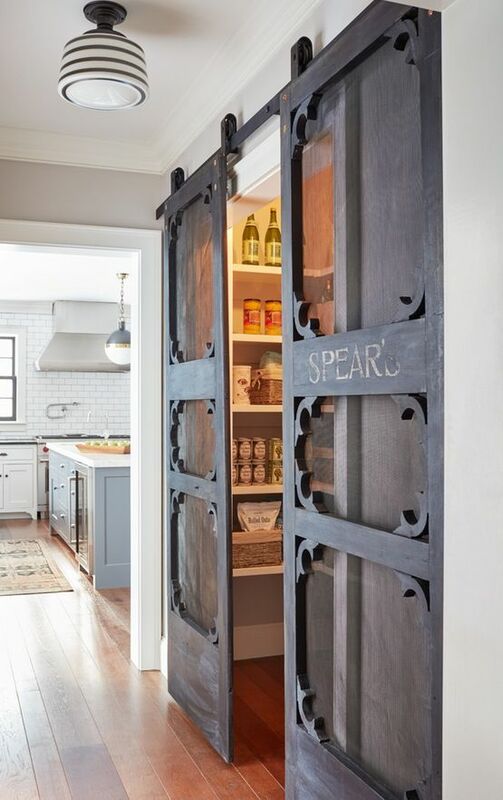 If you are looking for a way to give the functional space a vintage farmhouse look, you can just build 2 panels similar to the barn doors then stained them black and voila! Tip: You can also hang a sign (or two) like in the picture. 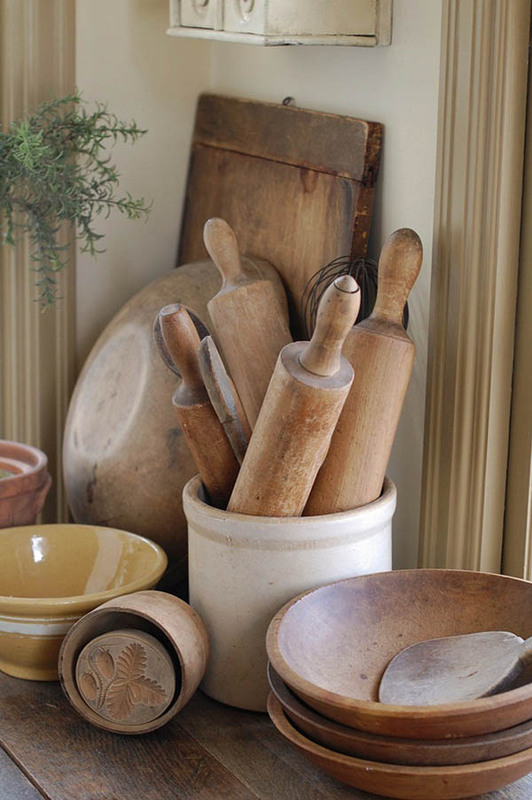 You can find tons of antique kitchen stuff in the Antique shops. 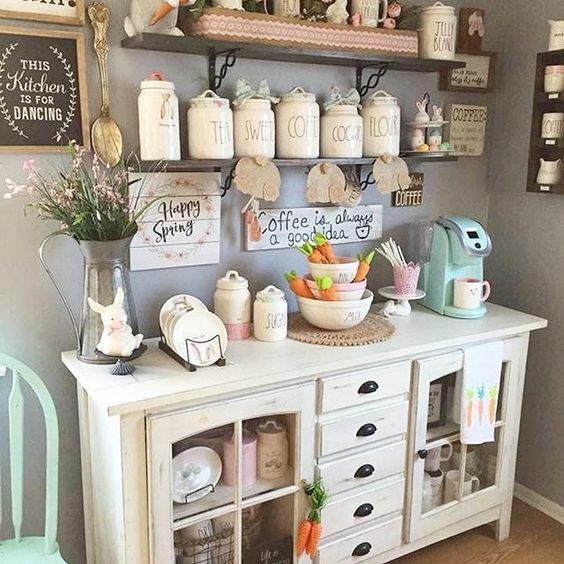 This DIY functional farmhouse kitchen vegetable (and fruits) stand reminds me on a Sunday farm market stand. It would fit well a smaller and a more spacious room. It’s a great place to store food properly. You can find the full tutorial on how to build one for yourself here. I found this wooden rustic island very functional and stylish at the same time. It perfectly pairs with the overall design which, by the way, is a nice combination of antique and contemporary decor. 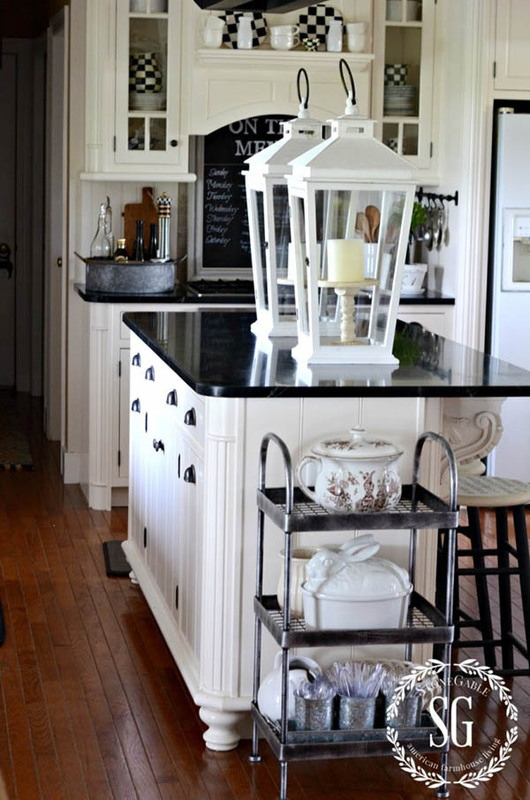 Some of you may find this small farmhouse kitchen design a bit unusual due to the oversized lanterns. I think they add some texture and make the kitchen space more welcoming and cozy. Plus, their white color contrasts the black countertop of the island. 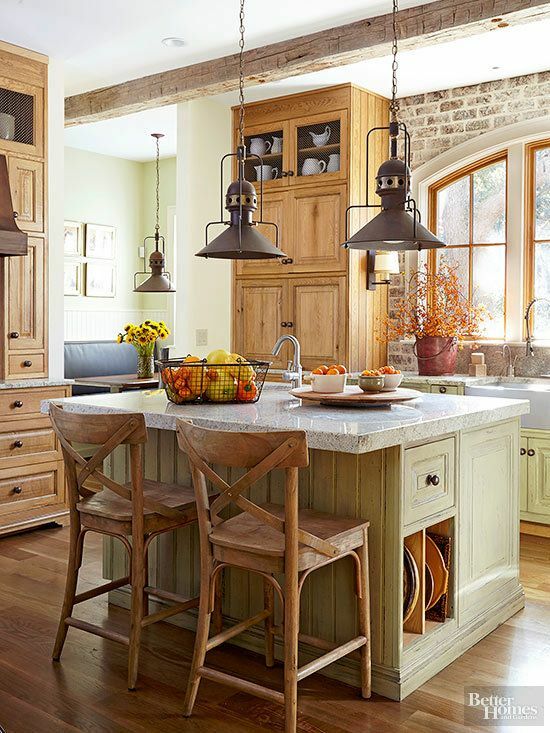 Farmhouse pendant lights are a must-have to complete the look and atmosphere. The wooden floor adds the warm feel and contrast to the kitchen. This is another idea for a farmhouse island. As the opposite of the previous ones I’ve shown you, this one is looking more expensive and modern. However, the Grocery storage brings warmth to the overall design. This design is made by the talented interior designer – Kristina Crestin. I love how she managed to separate a little buckle storage space by creating this stylish wooden old-looking door with a sliding mechanism. 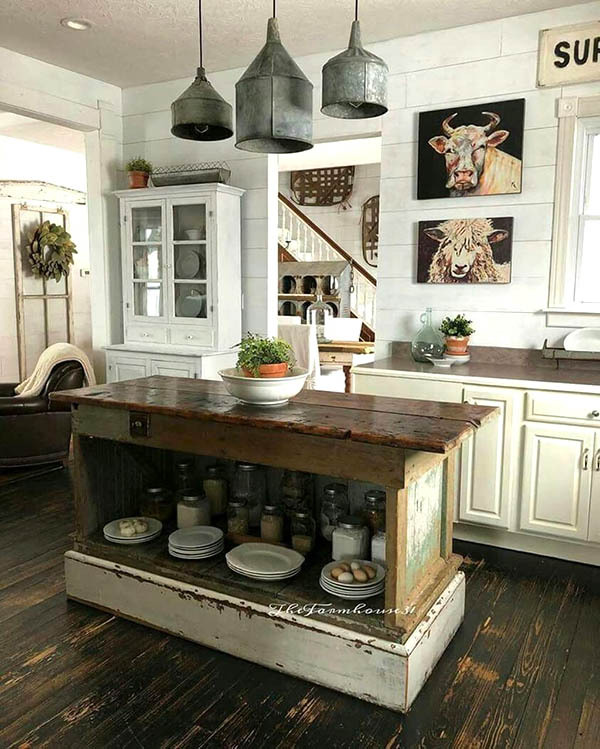 I would like to share with you this typical farm open kitchen and resting area decor with a charming island and some incredible accents like the wall art and the fabulous farmhouse pendants. Who said that the marble countertop does not fit a vintage farmhouse kitchen decor? This rustic design did catch my eye because of the vintage-inspired accents and the lovely wall decor. The massive wood kitchen island is the perfect spot to gather friends and family for a drink or an unpretentious cozy dinner. 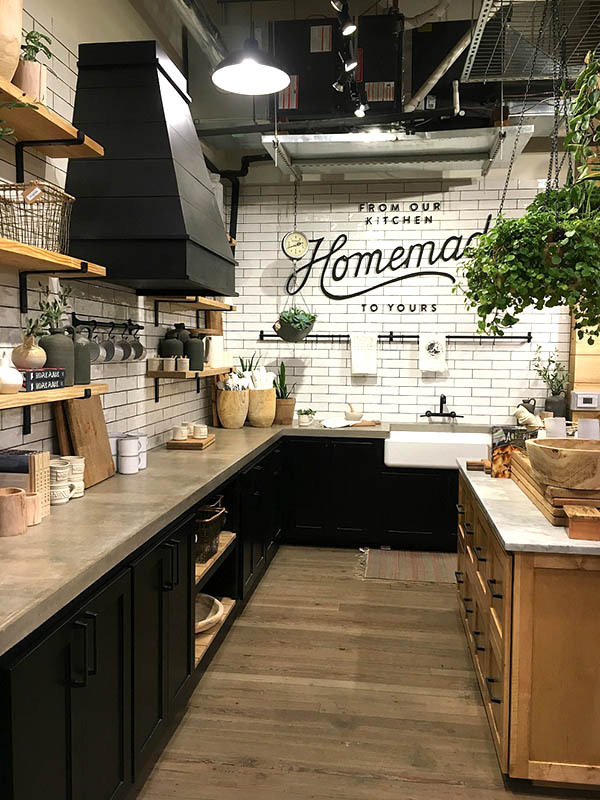 The look of this farm kitchen space is not open at all but its design is very practical and sharply-refined, with a large dark wooden butcher countertop combined with wire stands, classic glass jars, and a large vintage metal sink. 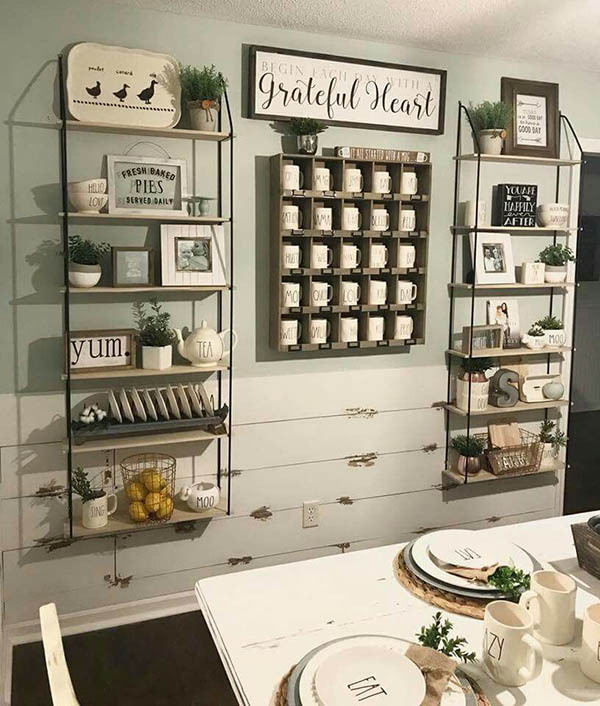 With such an authoritative piece of art (I’d say) your farmhouse kitchen will definitely shine and will turn into the most used room in the house. This cute table centerpiece could be easily made at home. 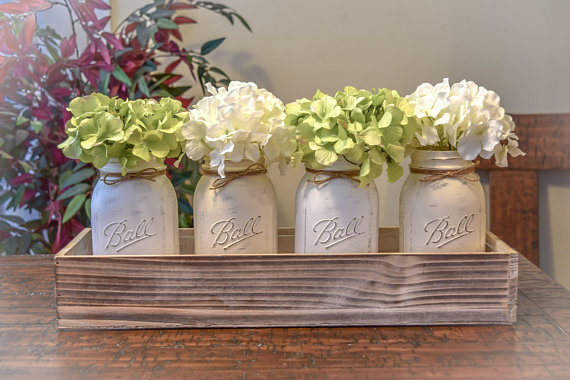 It includes a wood planter box, four-quart mason jars, and four hydrangea stems. Everything in this picture screams “A-N-T-I-Q-U-E” – the Black & White framed photo, the fireplace, the massive chest wood table in the center. 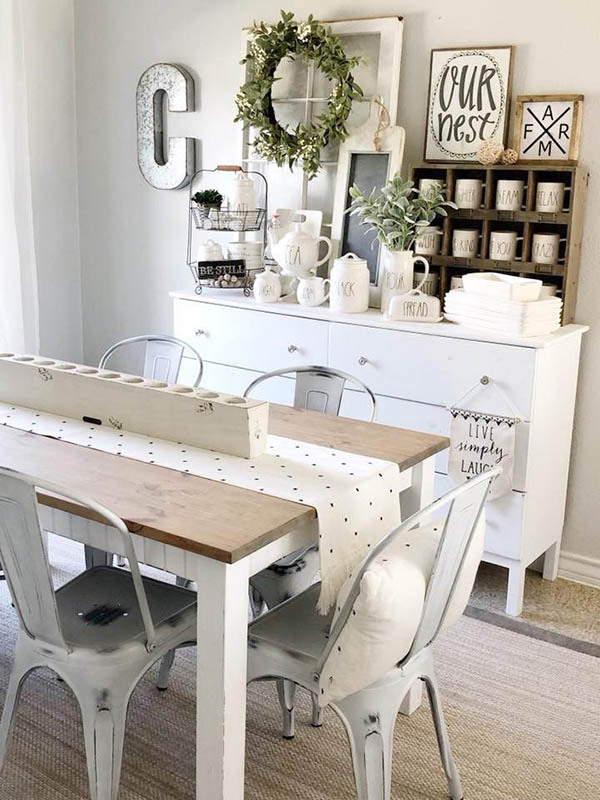 I decided to share this rustic farmhouse decor idea with you because it kind of brings the sense of a past Epoque (from French, means ‘time’). I love this design because it is very bold and it plays with materials, tones, and shapes. It reminds me a bit about one of my favorite dining spots in New York. This cute shadowbox filled with tiny mugs provides a lovely backdrop in this character-driven dining area. 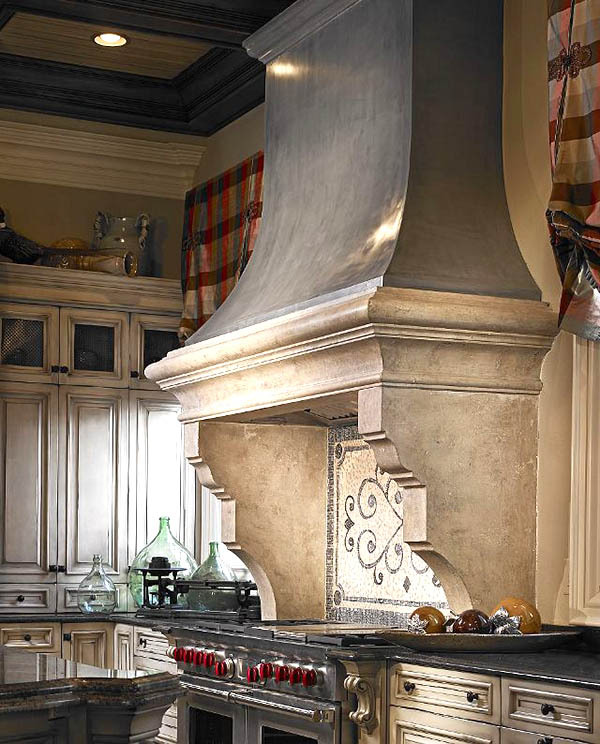 In combination with the symmetrical open shelves, they create a perfect finished country house kitchen design.